A little over 5 years later, I have found an opportunity to revive the life that Obama breathed into the English language when he gave his acceptance speech. I am returning another great Kadir Nelson work to it’s rightful place in the forefront of the book list. We have seen the President’s face many times in the past five years, addressing audiences in laughter and despair, so it has not come as a surprise that he will be in such a high-esteemed position. The same allure that led up to his speaking engagements several years ago as people compared his speaking style to the greatest orators, has been replaced with news-feeds abuzz with debate over which social issues are the MOST pressing to discuss. Although I too, contributed my 140 characters many-a-time to this cyber conversation, I feel as though it is my responsibility to remind the community of the significance of his Black body in a historically white dominated space. My words alone can’t do enough justice to preface the upcoming State of The Union address with the necessary historical, and social facts that made such an event seem almost impossible to my people as little as 30 years ago. 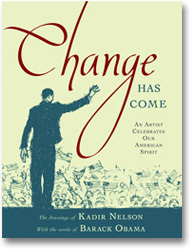 I instead, am recommending another Kadir Nelson book in the hope that his evocative illustrations will capture the significance of every time our Barack Obama has, and will address the United States of America as our President. Below is the video preview for the above book, Change Has Come.